Swatch Pay One of the First Low-Tech Payments Wearables That Can be Provisioned After the Sale: How It Works | NFC Times – Near Field Communication and all contactless technology. 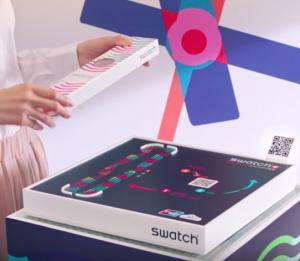 Swatch Pay uses a "Swatch Box" to provision card credentials onto its new line of analog payments watches in China. The box is mainly a special NFC reader/writer used to transfer card data, including tokens, onto the watches. Switzerland-based Swatch Group announced Tuesday in China that it will enable consumers to buy its second-generation Bellamy watches first then be able to provision them right in the store with their eligible bank cards. Provisioning the cards after the sale gives consumers more choice of the cards they can load onto the contactless watches and also enables them to activate the watches immediately to begin tapping to pay. In this case, the cards will be tokenized before being loaded onto the watches. Article has about 1250 words.